“SWBG expresses its profound disappointment at the announcement made by the Scottish Government regarding the protection of beavers. This timid, toothless compromise will satisfy neither conservationists nor farmers, both of whom need clarity on this issue after years of uncertainty. Until full legal protection is in place it will be impossible to move forward and establish a sensible protocol for management of this important species, whose valuable ecosystem services, including the mitigation of flooding, have been comprehensively proven by the recent publication of scientific studies carried out in the Scotland and England. 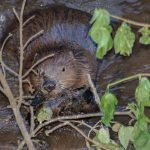 NextBeavers are to be legally protected in Scotland!